Earlier this month, Comedian Joe Rogan spoke out against dolphin captivity at The Mirage to The Las Vegas Review Journal. Rogan, who had a show scheduled at The Mirage Room, a theater that hosts the “Aces of Comedy” comedians decided to switch venues due to his opinions against dolphin captivity. The Aces of Comedy is an ongoing show at The Mirage showcasing a lineup of comedians performing at “The Mirage Room”, including the biggest names in comedy. Comedians such as Jay Leno, Gabriel Iglesias, Nick Swardson, Ray Romano, Ron White, Daniel Tosh and Tim Allen all have upcoming events at The Mirage. The Mojave Dolphins Campaign has recently heard from comedian Nick Swardson, who is scheduled to perform October 9th, and has agreed to look into the effects of dolphin captivity and the emotional and physical suffering dolphins endure at The Mirage’s Dolphin Habitat. We at Free The Mojave Dolphins have had a call to action in place to contact the upcoming comedians urging them to do the same as Joe Rogan and change venues for their shows with letter templates and pre-automated tweets directed at each comedian. The Mirage was inspected by the USDA in late June after a lack of shade complaint was submitted by Mojave Dolphins. The inspection yielded a citing for sanitation under 3.107 (b) of the Animal Welfare act stating “Food preparation/kitchen: There was a brownish-yellow, raised, foamy substance attached to an area near a pipe at the junction between the wall and the ceiling.” The citation was to be corrected by 7-16-15 but there has been no follow up from the USDA on whether this sanitation violation has been resolved. 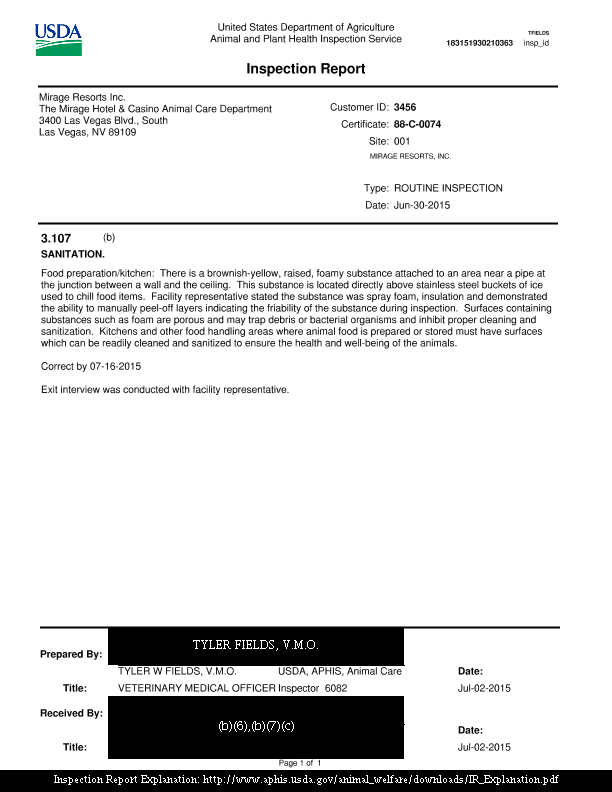 The inspection was prepared by USDA, APHIS, and Animal Care Veterinarian Tyler Fields who is a local Las Vegas small animal veterinarian with no known expertise on marine mammals. Please use the attached letter template and send to APHIS representative Robert Gibbens at [email protected] asking them to send a qualified Marine Mammal Veterinarian to follow up on the sanitation violation that should have been corrected.